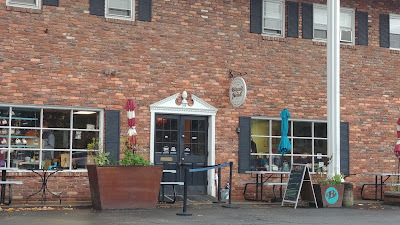 In September we watched an episode of Southern & Hungry where Damaris & Rutledge went to Asheville and to Biscuit Head. 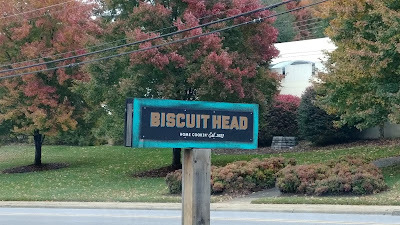 We both started drooling over the biscuits and decided that when we went to Asheville, we'd definitely go to Biscuit Head. There are 2 locations. We went to the one on Biltmore Ave. You order at a counter and then they show you to a seat and place a number on your table. When your food is ready, they bring it over. 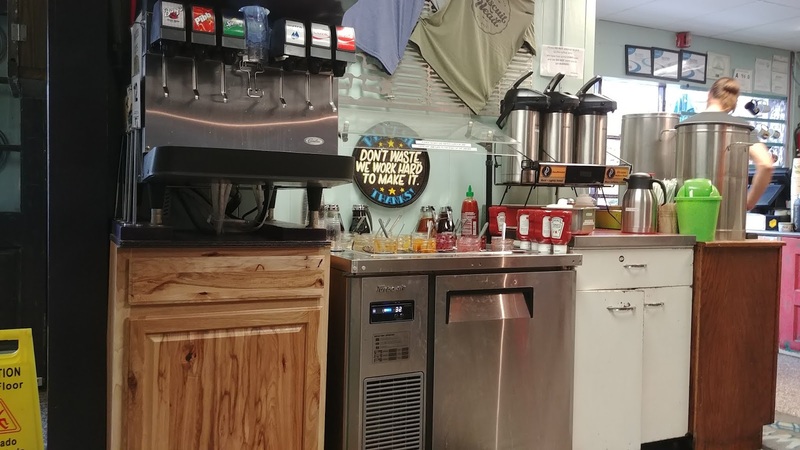 Pictured above is the drink and jam bar. They have many kinds of jellies/jams for your biscuit. We tried a wee bit of each: sour cherry, strawberry, sweet potato, and some others I forget. SP ordered the Country Ham Biscuit (biscuit with country ham, fried green tomato, cheese egg, and red-eye gravy). I didn't know before going to Asheville what red-eye gravy is. It's a very thin gravy made from the drippings of pan-fried country ham mixed with black coffee. I expected a strong coffee flavor, but it was subtle and really yummy. SP ate the entire huge biscuit sandwich. I ordered the Fried Green Tomato Biscuit (biscuit with fried green tomato, brie, tomato, 2 poached eggs, and smoked tomato hollandaise). I asked for the hollandaise on the side and well poached eggs. 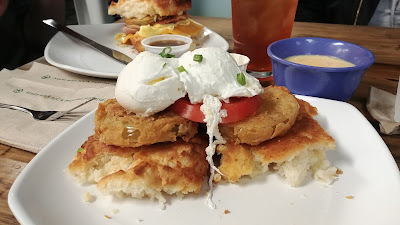 As you see above, the hollandaise is on the biscuit. That was OK, I could deal. But when I cut into the egg, it was a lovely poached egg, that is to say it was runny and slowly oozed all over, but since my stomach is so darn sensitive, I always ask for well poached which I don't think tastes as good as normal poached but I'd rather not have a stomach revolt at 11 am and ruin an afternoon of fun. So SP took it back to the counter. I felt terrible because it turned out they had made mine correctly, but someone grabbed the wrong plate. 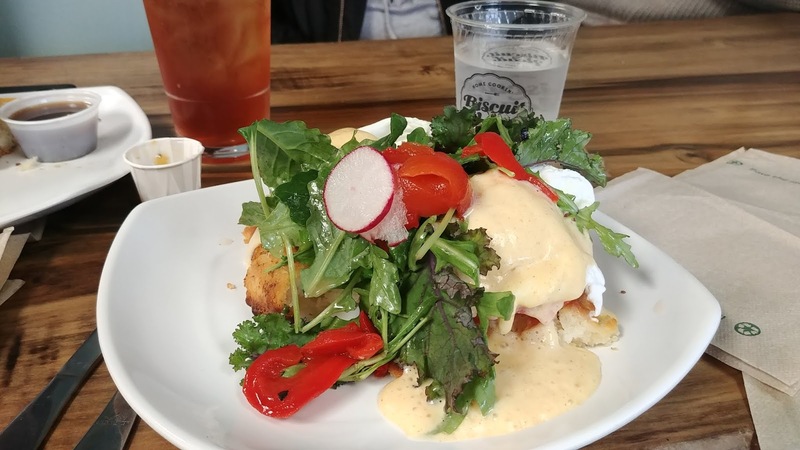 The original one served to me is actually The Asheville Benedict (open-faced biscuit topped with charred scallion cream cheese, fresh tomatoes, 2 poached eggs, hollandaise, roasted red peppers, and a tossed kale salad). I felt awful because I didn't even register that it was topped with salad and red pepper, which mine wasn't supposed to have, and since I'd cut into the egg, they couldn't serve it to anyone else. If I realized it was the wrong benedict, maybe they could have served it to the correct person. 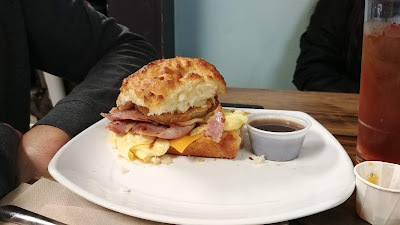 My biscuit, above, is not as pretty since the sauce is on the side. But oh was it delicious. And huge. SP had to help me and even then we left behind some biscuit. We both really like Biscuit Head. We went around 11 am and it wasn't too crowded, which was nice because I was really hungry. 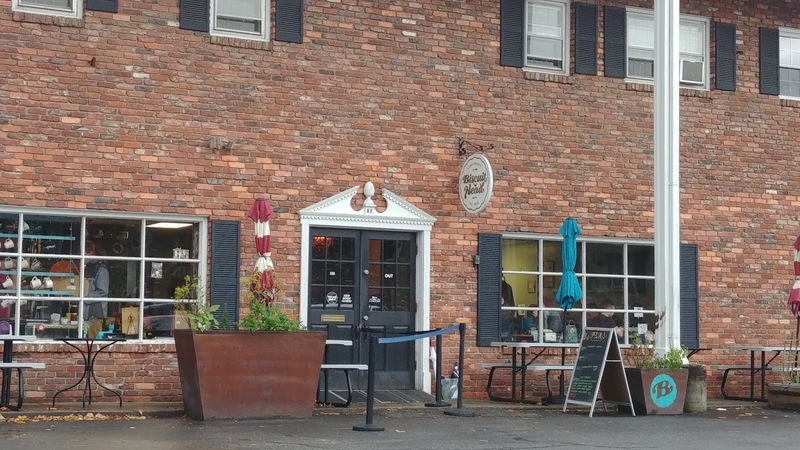 The next time we're in Asheville, we'll definitely be back here for another biscuit.